If you have already experienced an Under the Piano session with me, you know the magic of being bathed in beautiful vibrations from a piano for 40 minutes. If you have not, you will not believe it until you can actually experience it. This is short notice, but if you are available on Friday, February 28th at 5:15pm you can experience an Under the Piano music spa at a whole new level. Under a Mason & Hamlin 9′ 4″ Concert Grand Piano. A colleague and I had booked the Silk Purse Gallery for a different event that night and we have had to cancel. However, I am taking it as an opportunity to do some recording with a divine musical instrument or to make a special offer for past Under the Piano clients. I have already done a workshop using this piano and also with the 9 ft concert Steinway at the Vancouver Symphony Orchestra’s Pyatt Hall. Participants who have experienced Under the Piano under both my own smaller grand piano and these larger pianos have noted that the level of vibrations under a 9 foot concert grand is greater. I this case, size does matter. The Silk Purse Gallery’s Mason & Hamlin piano is nearly 4 feet longer than my 5′ 9″ Kawai Grand. Deeper, richer and more powerful bass notes and a much larger sound board make for more vibration. Plus this piano is long enough for one person to lie under lengthwise. 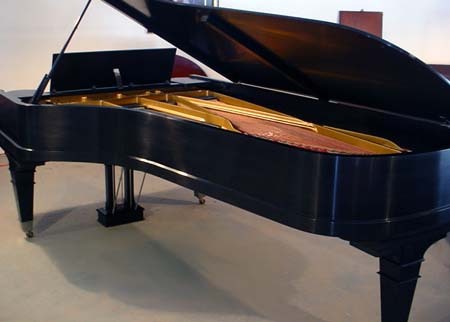 The value of a Mason & Hamlin CC 9’4″ Grand Piano is over $120,000 US! Here’s a recording with this piano that gives you a glimpse of how rich and powerful the bass is. However, a recording can’t begin to do it justice. If you would like to grab this opportunity, or if you know someone who would like this, please contact me as soon as possible to reserve your session. I have already booked a session for a client at 7:15 pm, so you must be on time in order to have a relaxed and unhurried experience. I am not charging any extra fees for this opportunity despite the booking fee for the room. Future opportunities will likely cost more. Previous post: Why Would You Love to Lie Under a Grand Piano?